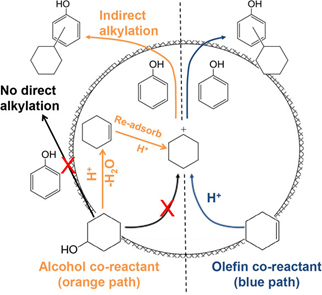 Alkylation of phenol with cyclohexanol (orange path) occurs after the majority of cyclohexanol is dehydrated to cyclohexene. The reason the mechanism follows this path is not due to limited access to cyclohexanol, rather it is due to the lack of a reactive electrophile when a large fraction of cyclohexanol is present. Copyright 2017, American Chemical Society Enlarge Image. Dr. Jian Zhi Hu, Dr. Zhenchao Zhao, Dr. Hui Shi, Dr. Johannes Lercher, and their colleagues from Pacific Northwest National Laboratory identified a key reaction mechanism associated with zeolite-catalyzed alkylation of phenol with cyclohexanol. They made this discovery using in situ high-temperature and high-pressure magic angle spinning nuclear magnetic resonance (MAS-NMR) spectroscopy. Why It Matters: Scientists now have an understanding of how the catalytic activity, mechanism, and reaction pathways depend on three factors. These factors are the concentration and strength of acid sites, the steric constraints for the reaction, and the identity of the alkylating agent. Summary: Detailed kinetic and spectroscopy analyses showed that phenol alkylation with cyclohexanol does not appreciably occur before a majority of cyclohexanol has been dehydrated to cyclohexene. Alkylation reactions are slowed as long as the alcohol is present. In contrast, alkylation products are readily formed when the solution initially contains just phenol and cyclohexene. "Experts in catalysis and NMR worked together to allow us to watch important chemical processes occurring at high temperatures and pressures," said Dr. Karl Mueller, PNNL's Chief Science and Technology Officer for Physical and Computational Sciences. "Before, we had to infer what was happening by either stopping the reaction (i.e., ex situ) or only measuring the final products, neither of which can show us a complete picture." User Facilities: All of the NMR experiments were performed in the Environmental Molecular Sciences Laboratory (EMSL), a national scientific user facility sponsored by the Department of Energy's Office of Biological and Environmental Research, and located at Pacific Northwest National Laboratory (PNNL). Computing time was granted by a user proposal at EMSL and by the National Energy Research Scientific Computing Center (NERSC).